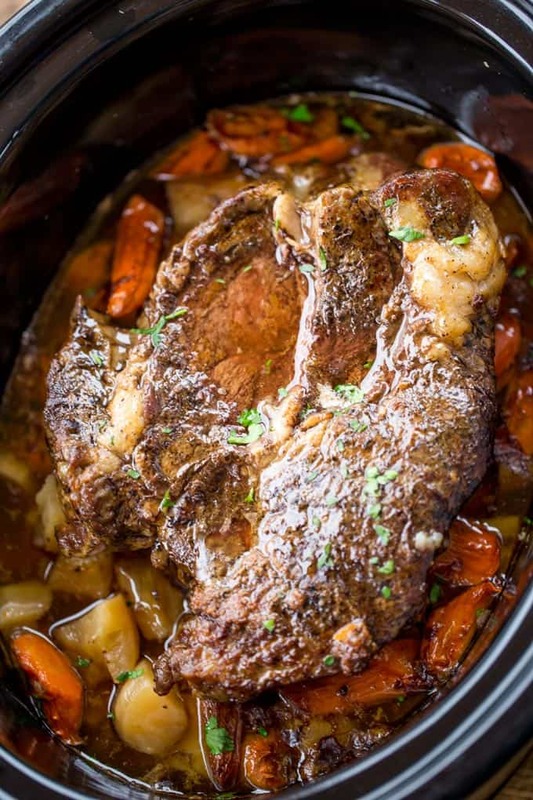 Ultimate Slow Cooker Pot Roast that leaves you with tender meat, vegetables and a built in gravy to enjoy them all with in just 15 minutes of prep! Perfect weeknight dinner! 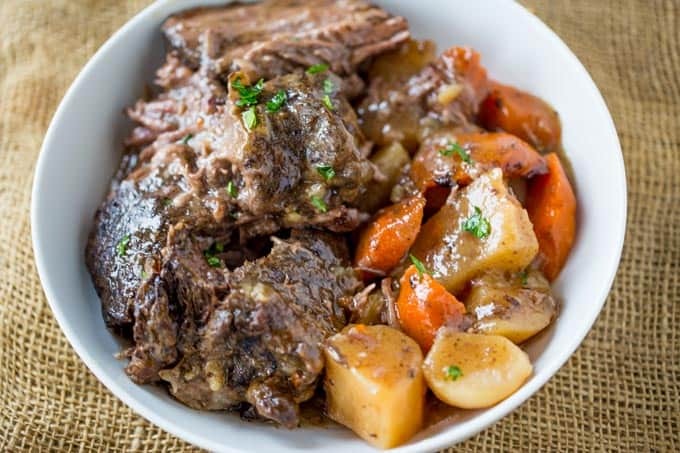 Ultimate Slow Cooker Pot Roast is a perfect weeknight meal you can make with little effort the morning of and you can even prep the night before. 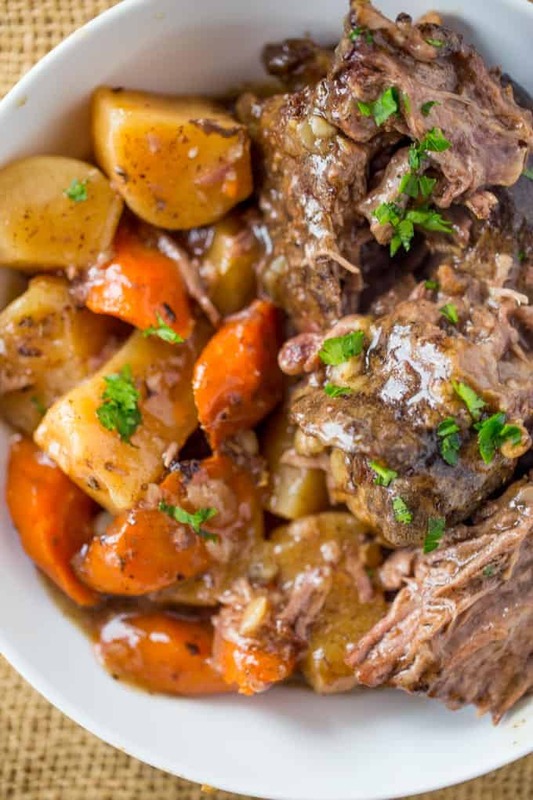 This pot roast recipe is a pared down version of a recipe I used to use and adapted to give to client’s who’s children were going off on their own. They wanted easy recipes they could make that would remind them of the meals I had made for them. 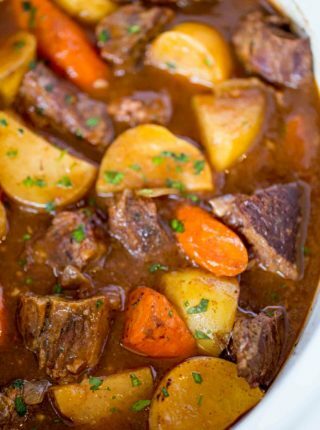 This dish delivers on that promise offering a warm, hearty, healthy meal with little cooking knowledge needed and even without searing the meat you’ll have a delicious meal! 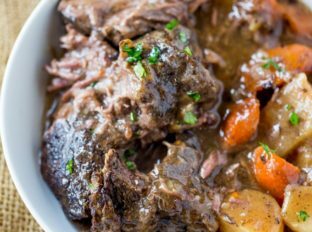 The great thing about this Ultimate Slow Cooker Pot Roast is that the whole meal really is made in one place. We like to serve it with a side salad to add a fresh flavor to the meal but for wintery weather and busy weeknights this is pretty much the gold standard for us for delicious food! You can add in other herbs and vegetables as you would like. We love playing with adding different root vegetables like turnips and parsnips, sometimes we add onion or sweet potatoes. In the fall we love different squash too. This dish can be adjusted to your favorite veggies with no problems! Browning the beef in a pan before adding it to the slow cooker is a step I would not skip if even remotely possible. That crust is delicious and you don’t want to miss it. Seasoning – Yes it looks like a lot of salt, but you also have to remember you have 3 pounds of vegetables under the meat you are seasoning too. The cornstarch finisher – To thicken the liquid you’ll need some cornstarch. I usually add this in the last hour of cooking but a quick saucepan heat-up of the liquids with cornstarch will take care of it for you in just a couple of minutes too. It is just one more dish to wash, haha. Yukon Potatoes – I love the buttery texture of a yukon gold, you can alternately use russet potatoes here without any problems too. If you have fresh thyme by all means use it, I just like how easy this recipe is and pantry friendly so I normally use dried thyme unless I already have fresh on hand. Better Than Bouillon: I use this for most recipes where I call for broth (I have it in Chicken, Vegetable, Beef and Mushroom (I love this one for adding umami flavor to things). Its so easy to just add a spoonful to some water and it is just beef broth that has had the water cooked out of it. Season the chuck roast with the Kosher salt, pepper and thyme (if you are sensitive to sodium, adjust to your taste or you can even leave the salt out altogether since you're adding broth). Heat your pan (or if you can brown in your slow cooker, do it in that insert to medium high. In your slow cooker add the carrots, potatoes and garlic. So good and easy to make! My husband said it was his favorite meal ever which is saying something. This is the best receipe ever for roast. So easy and everyone loves it. Made it month ago, fixing it again tomorrow. If I have smaller potatoes could u put them in the last hour to not have them mushy? 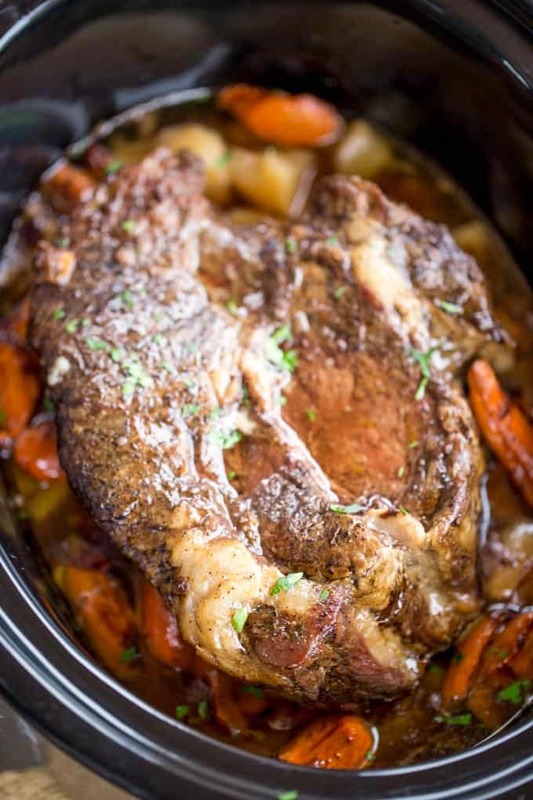 This is the best slow cooker roast I have ever made. I followed the steps exactly as written and I used a bottom blade roast. It literally falls apart when you cut into it. And the gravy brought me back to my childhood. I would not hesitate to serve this at a dinner party. Thank you! I’m not able to find the recipe card that is referenced where you can adjust the size of the roast and determine your cook time? If you hover over the servings, a slider tool will pop up that you can adjust. Hope this helps! This is hands down the best roast ever! I have tried all sorts of recipes and they are all really good but this is not only simpler but so much tastier! Whenever trying new recipes, I follow the instructions exactly as written and I did just that. 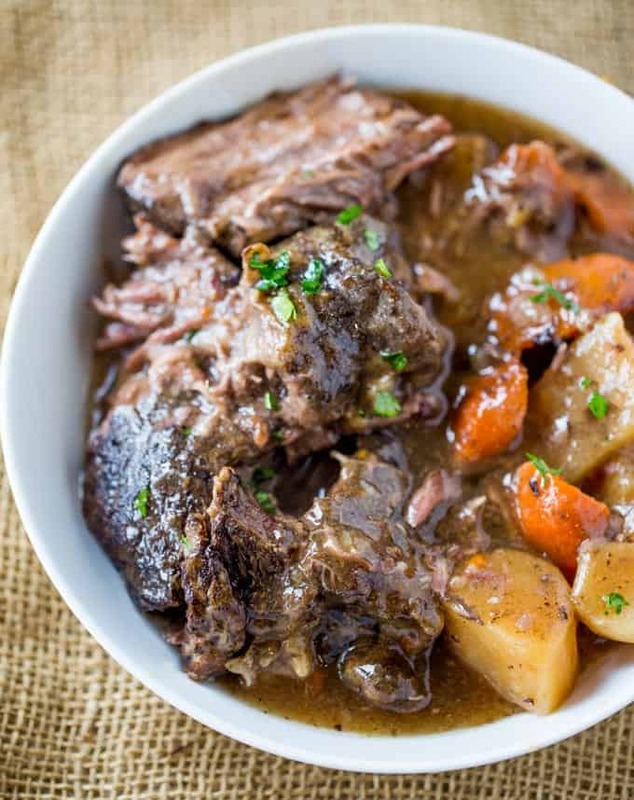 I use my slow cooker for convenience so I usually shy away from recipes with multiple steps such as the extra step for searing the meat first. I only do a roast on Sundays and Sabrina has never led me astray (lol!) so I tried this recipe. The entire prep, including the searing, was pretty quick and so worth it. In the end, I felt like a bona fide chef. I forgot to add the cornstarch at the end but it was still awesome. My family loved it so much that I am making it again today and will add the cornstarch this time. I am sure this would be good with substitutions according to individual taste, but it is not necessary. I love recipes with few ingredients and quick prep and this fits the bill. The taste makes one think that I spent a lot more time prepping than I actually did. Thank you so much for coming back to let me know. I’m so happy you all enjoyed it so much. The store only had 2.5lbs chuck roasts! 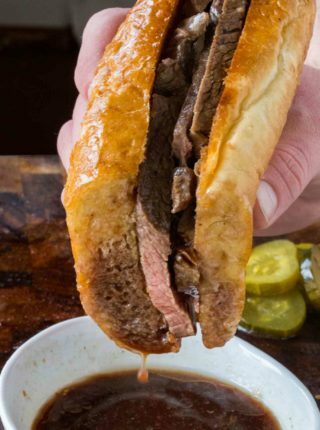 How should I adjust the cook time if I follow this recipe with only a 2.5lbs check roast? I would recommend cooking on low for 6 to 8 hours or High for 4 to 5 hours. Enjoy! Fantastic!! 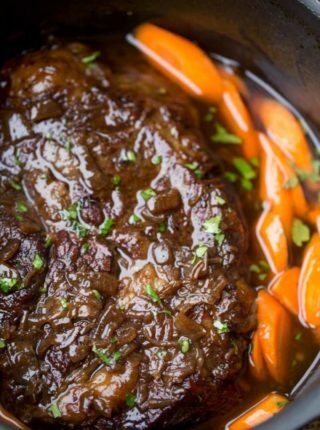 Best pot roast ever!! I have an 8qt crockpot and got a small roast (2.7#) on accident. Added onions and 3 cups beef broth (total). I probably would’ve been fine with just the 2 cups but my crockpot cooks HOT fast. 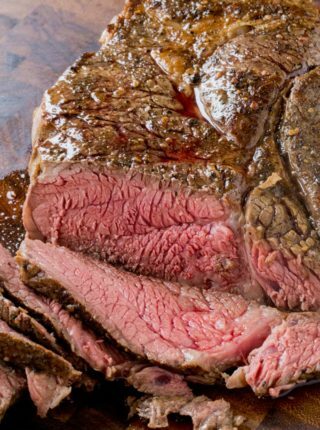 The roast was done within 6 hours – I cannot wait to make this again! Thank you so much for a great recipe and clear directions! !